Published: March 20th, 2019 by Simon. Filed in Bathroom and tagged Rimless Toilets, Toilet. Rimless toilets are one of the hottest bathroom products today. They have revolutionised toilet design, and are gaining popularity very quickly. As the head of purchasing at Ross’s Discount Home Centre, I couldn’t help by notice the demand for rimless toilets in Perth. So to satisfy the demand, we have added the Peak Rimless Toilet to our range. Today, I will showcase our rimless toilets in a little more detail. But before that, let’s first take a look at what rimless toilets are and why there is so much buzz around them. How are rimless toilets different from standard toilets? If you’ve never seen a rimless toilet suite, it might be difficult for you to imagine what one looks. Yet when you see one, you may not immediately be able to tell the difference between a rimless toilet suite and a standard toilet. As the name suggests, a rimless toilet suite does not include the inner rim which is present in all standard toilets. While rimless toilets look just like standard toilets, the difference is obvious on the inside of the toilet bowl. Rimless toilets work differently to standard toilets. 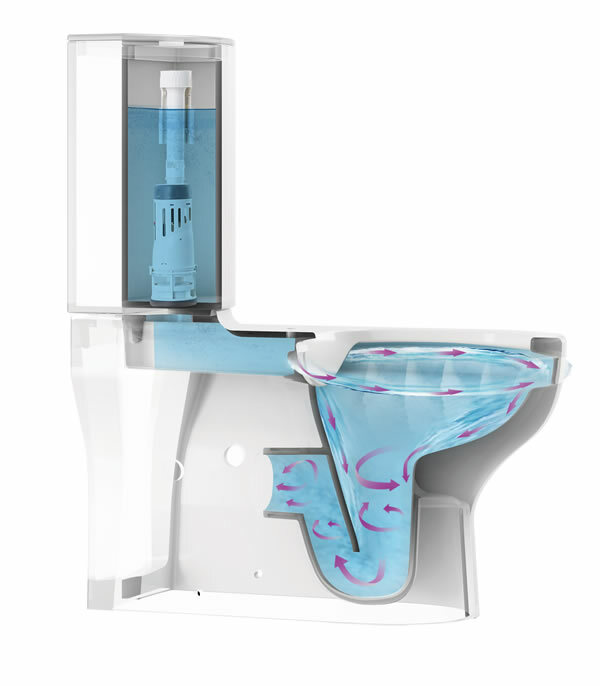 Most rimless toilets make use of a direct-flush mechanism in which water is shot around the toilet bowl, whereas in most standard toilets, water is distributed around the toilet bowl under the rim. 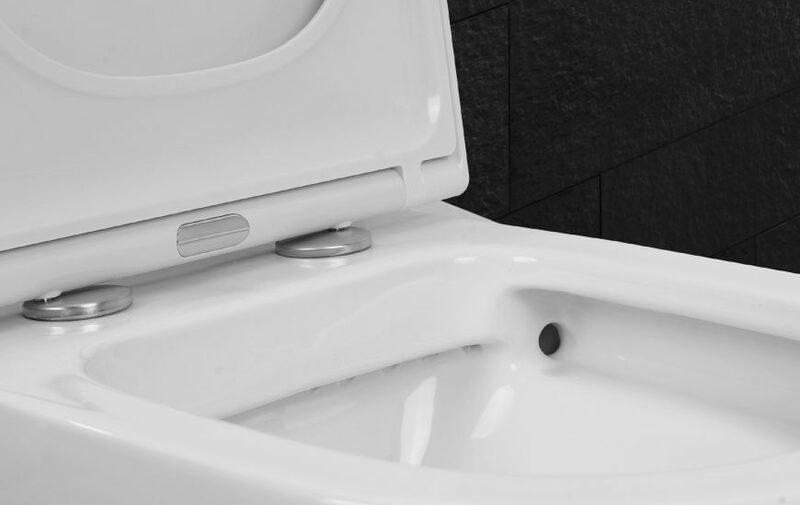 While it may seem that removing the inside rim of a toilet bowl may not make much of a difference, the reality is that rimless toilets offer many benefits over standard toilet suites. First of all, they are much more hygienic than standard toilets because there is no inner rim for germs to thrive. Because of this, rimless toilets are also much easier to clean and maintain as opposed to standard toilets. Moreover, their direct-flush mechanism does not cause water to splash about. This makes your entire bathroom much more hygienic. And while direct-flushes are far more powerful than standard flushing mechanisms, they are also more water efficient. You will save money and preserve the environment by using less toilet detergent in rimless toilet suites. Rimless toilets are available in ultra-modern and stylish designs. And while they may be fairly new to the market, they are still available at attractive price points. The price of a standard rimless toilet suite is comparable to that of a mid-range standard toilet suite. Rimless toilets are affordable, and they are suitable for almost everyone. Where to find rimless toilets in Perth? When it comes to finding high-quality rimless toilets in Perth at affordable prices, choose us at Ross’s Discount Home Centre. The Peak Rimless Toilet Suite is stylish and revolutionary. It features a pure flush system and is suitable for bathrooms of all sizes. It is one of the most hygienic and water efficient toilets available in the market today and is manufactured to the best standards and exhibits superior artistry. It is rated as WELS 4-star and features an excellent water rating of 4.5/3 L flush. Best of all, you can purchase the Peak Rimless Toilet from our store for just $499! Rimless toilets are one of the latest trends in bathroom design. As the name suggests, they do not include the inner rim that standard toilets feature and they make use of a direct-flush mechanism as opposed to standard flushing mechanisms. Rimless toilets are much more hygienic and easier to clean and maintain than standard toilets and their direct-flush mechanism is also more powerful and water efficient than standard flushes. Rimless toilets are available in ultra-modern and stylish designs, and they are as affordable as mid-range standard toilet suites. For high-quality rimless toilets in Perth at the best prices, look no further than us at Ross’s Discount Home Centre. Click here to view the Peak Rimless Toilet Suite in our online store and shop online to take advantage of our free delivery across Perth Metro. Make the Everest Toilet Suite your new throne! Choosing the right toilet is vital!